The blood lust and greed in Taiji come to a climax as the killers refuse to stop, even after they reach their kill quota. Inhumanity and greed are not limited to the confines of the Cove. Their presence is seen and certainly felt by the dolphins that are held prisoner within the captive facilities throughout Taiji. The killers of Taiji have been working hand-in-hand with trainers from the Taiji Whale Museum, Dolphin Base, and Hotel Dolphin Resort throughout the season to rearrange the pens located in the Taiji Harbor. February 8th was not different within that aspect, as the killers would stay in port to rearrange the pens with trainers. However, the killers and trainers had additional plans on this day. 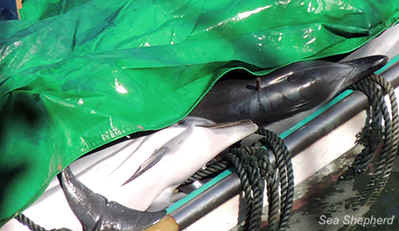 They strategically placed skiffs and a killing boat around the Taiji Harbor pens to hide two unknown species of dolphins, which were loaded into slings that would ultimately end up attached to the killing boat destined for sea. These creatures became accustomed to their dismal life in captivity, and were unexpectedly dropped at sea where they were forced to fend for their lives without their pod that was now nothing more than slabs of meat. The prognosis of survival for these dolphins is not very good and most likely those two dolphins ended up floating lifeless in the home they should have never left – the ocean. After the killing boat left for sea, the killers who remained at port would shift their focus for the rest of the morning to the creation of two new pens to be placed in the Taiji Harbor. These pens were put together with the equivalent amount of care the killers put into the dolphins they capture, which is just enough to keep them operational and nothing more. After a day off, the killers returned to work on February 10th to start where they left off previously. An additional pen was assembled in the same fashion as day’s prior and again placed in Taiji Harbor. Unfortunately the addition of three pens meant that a large number of Pantropical Spotted dolphins that were placed within a netted area of the Taiji Harbor had either been secretly transferred or died and quickly taken out of the pen. As the killer’s worked on land to maneuver dolphins for the captive industry to pad their wallets, their thirst for blood would only increase and come to an obscene climax on February 11th when a pod of 100-110 Striped dolphins were driven into the Cove. If the drive toward the Cove did not look and feel like a grotesque horror movie, the further actions of the killers did. The killers drove the Striped dolphins further into the Cove and separated the pod into three groups. As each group entered the killing Cove chaos immediately broke out. Members of the pod were cognizant of the killers’ intentions and tried desperately to escape their murderous grip as they threw themselves onto the rocks. However, killers in dive suits swam along and tried to drown some members of the pod as they panicked along the rocks. Killers in wet suits did not stop there. They would show their brutality even more with another Striped dolphin as it jumped onto the rocks, but became caught between the nets set up along them. On impact the dolphin appeared to have injured itself, but one of the killers in a wetsuit did not care. He chose not to ease the dolphin out of the situation and instead grabbed the dolphin by the fluke where he carelessly ripped the being out. This resulted in the dolphin spending its last minutes alive, not only panicked, but also injured even worse, until it could only swim in a circle. 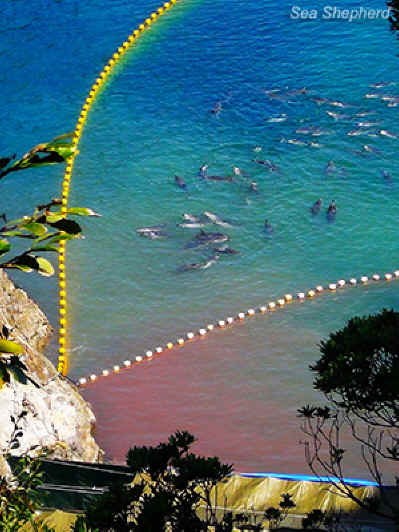 As the killers drove each group of Striped dolphins into the Cove, the waters became a darker shade of red with every helpless being that was murdered. Pod members were driven onto the killing shore where a metal rod awaited to be driven into the dolphin’s spine to paralyze them. After the rod was removed, a cork was placed in the wound to only limit the blood that runs into the Cove and the intelligent being is left to suffocate to death. After being driven into the Cove where they were forced to watch their family’s death and swim in blood left over from the horrible deed, 20 members of the Striped dolphin pod were driven out to sea. The result of this for members of the leftover pod is just as cruel as slaughter. Many dolphins do not survive and can later be found washed up on the beaches of Taiji. The killing would only resume early the next morning on February 12th. All of the killing boats surrounded a pod of 17 Risso’s dolphins and trapped them within the confines of the Cove, within an hour after they left port. Just as a member of the pod was netted into the killing Cove it tried desperately to swim through the nets, where it only became entangled. Skiffs of killers passed by the Risso’s dolphin and they did not bother to care as the helpless creature eventually drown. Other members of the pod also tried to swim unsuccessfully through the nets. However, killers in dive suits carelessly untangled these members before they, and the rest of the pod, were driven and violently killed. After two days of merciless killings, the Cove remained blue for a week in large part due to heavy rain and wind. On those days the killers took a day off, but the Cove Guardians did not. As a result, on February 18th the acquisition of two Belugas from Russia was documented at Dolphin Base. As with every move in Taiji, the transfer was done in the middle of the night or early morning to avoid our cameras. 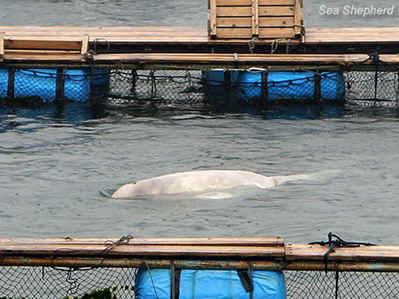 The two whales were placed in the typical small enclosures in Taiji. They appeared to be very lethargic. Since then Dolphin Base has gone to the extreme measures of moving the whales to a different pen, where a large boat and a tarp now hide them. At the start of the day on February 20th, the killers were only allowed to kill 3 more Risso’s dolphins this season under the quota allotted by the Japanese Department of Fisheries. However, after the killers fought with a pod for two hours, a pod of 10 Risso’s dolphins were driven into the Cove. Thirsty for blood the killers hastily netted the pod into the killing Cove where the metal rods awaited to be hammered into the Risso’s dolphins spinal cords. The killers would disregard the quota allotted for Risso’s Dolphins as every member of the pod wound up dead on the butcher house floor.